Reverting a previous decision on August of 2009, judge Rakoff will now accept a $150 Million dollar settlement, same that was denied back in 08/2009, because it was only $33 million settlement. In the name of all those shareholders fleeced in the Bank of America- Merrill Lynch merger approved prior to the financial markets meltdown. Definitely proving these punishments first don't fit the crime, and do not address the financial institutions way of conducting business. Thank you Clusterstock. It would be interesting to see a map of bank properties that they deem worthy enough to foreclose on. resources efficiently and responsibly while accomplishing the agency’s mission. 7 percent increase over the $906 million authorized in FY 2008." --What this really tells me, is that you spent nearly a billion dollars in one year and could barely get a guy who had embezzled 50 billion over a period of 25 years. Going by this figure would mean that it will probably take Mrs. Shapiro ( SEC Chair woman) , another 20 some odd years to find another weisel, like Madoff. --A small suggestion, why not use the 970 million, to find out what is keeping Bank of America afloat eventhough they have sacrificed an executive in Ken Lewis,that led the entity to pay back its loan to the U.S. government, would'nt you rather support him, than reprimand him for his deed. Feb. 12 (Bloomberg) -- Harvard University Professor Martin Feldstein, who warned in 1997 that European monetary union would spark greater political conflict, said Greece’s fiscal woes expose the fault lines of the single currency project. A day after EU leaders promised “determined and coordinated action” to help Greece control its budget deficit, Feldstein said the weakness of having a single monetary policy and different fiscal policies is being revealed. Feldstein said European governments will have to find a new way to ensure budget deficits don’t get out of control. “There’s too much incentive for countries to run up big deficits as there’s no feedback until a crisis,” he said. While the European Central Bank sets interest rates for the region’s 16 economies, the practice until now has been that each country has to steer its economy and can set its own tax and spending policies. In his 1997 article, Feldstein wrote that while it’s impossible to predict whether political clashes will lead to war, “it is too real a possibility to ignore in weighing the potential effects” of monetary and political union. My wife and I are looking for a house. I'm grateful for sites like zillow.com that have made this search a little easier. I've noticed a trend since the housing meltdown started. Simply put, people think their houses are worth a lot more than they actually are. See exhibit A. 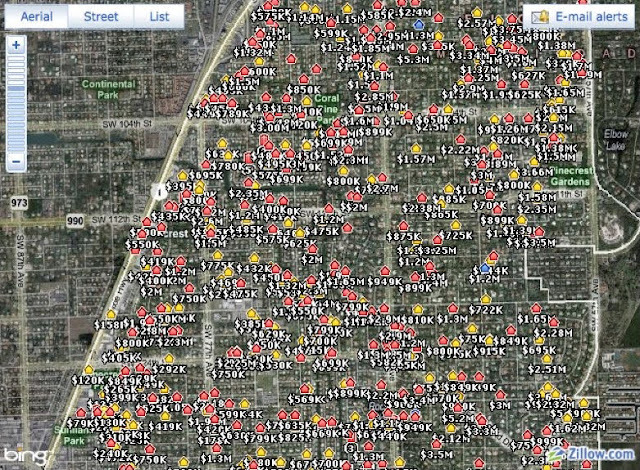 Local house prices in the Miami neighborhood of Pinecrest. Granted, each house is different but there is a huge discrepancy between the asking price (Red houses) and the bid (Yellow houses, the price that a house recently sold for). I hear a lot of hoopla about how housing prices having finally bottomed out but one look at this picture tells me we are no where near the bottom. Visit zillow.com to see how this matches up with your own neighborhood. in change (increase, or decrease) of price over a stated amount of time, or what they insanely call a minute inflation rate. increased 2.1 percent in the fourth quarter, compared with an increase of 1.3 percent in the third. the fourth quarter, compared with an increase of 0.3 percent in the third." This is one of my favorite Mish posts ever. Ask yourself, what has changed in the last three months? I notice a bit more outrage, but more is on the way. Most of you are aware that the state of California is crisscrossed with many seismic fault lines. Probably the best known is the San Andreas Fault, stretching from a point just southwest of Eureka in the North to the Mexican border in the South. What you probably did not know is theat the Speaker of the House, Nancy Pelosi, is introducing a bill in the House to change the name from the San Andreas Fault to the George Bush's Fault.